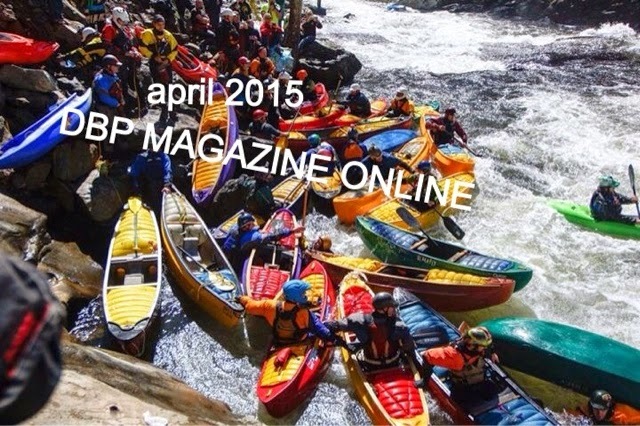 INSIDE THE UNBORED LIFE ~ THE ANGELA GREENWELL INTERVIEW by "Chicago"Toughill | DBP MAGAZINE ONLINE The World's Best Free Whitewater Publication. Each week Dirt Bag Paddlers selects a special female paddler to recognize in our Woman of Whitewater WEDNESDAY feature on our Facebook page. It’s an honor to elevate a person and spread their story to inspire others, especially young girls coming up and joining our community, and also to give our WOWWs their props, which are often long overdue. This is certainly one of my favorite jobs at DBP. PHOTOS AND BOATING – Are you infringing on someone’s copyright without knowing it? from 3/22/15). We first met her during our ALF “photo&footy” contest, where she entered some of her great photos. We asked her to submit two photos for April’s cover photo for the Dirtbags to vote on, and ran a caption contest. 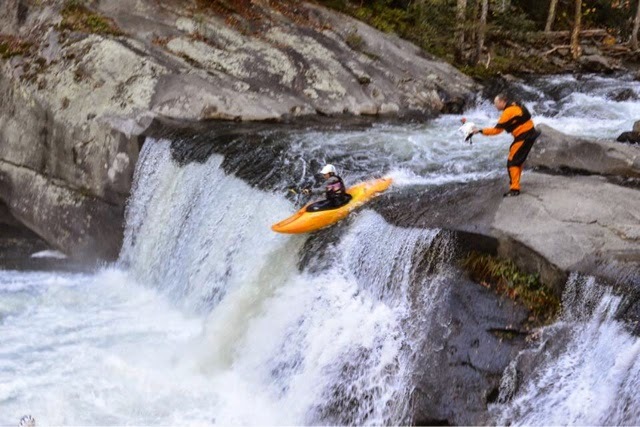 The winning photo, of the eddy below Baby Falls on the Tellico River during the OUT Race at Ain’t Louie Fest, was captioned by winner Melissa Zegers as “Dude where’s my boat?” The runner up photo, of boaters Wallacing downstream during the race, was captioned “This is wearing out my whistle…” by Levi Binegar. 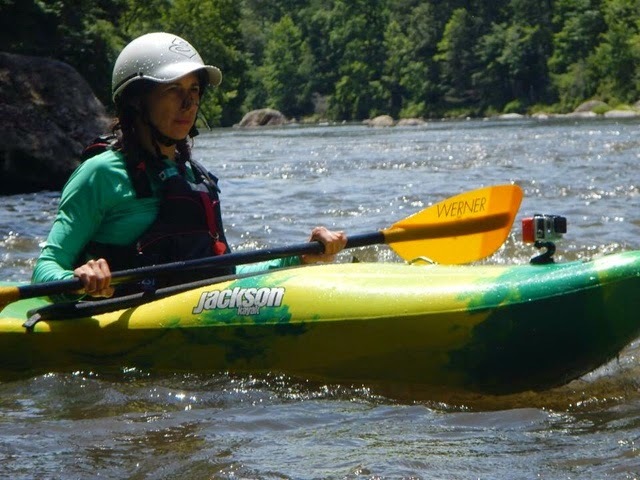 Angela is also a dirtbag paddler who loves the river like the rest of us, as the photos of herself clearly ascertain. This passion shines through in her photography of others on the river as well, like a sunbeam shining through a stained glass window. I was stoked to interview her right before she hit the trail for a 5 day hike. Enjoy, and join DBP in throwing out a hearty CHEERS to this week’s WOWW!! DBP: Reading THE UNBORED LIFE, it’s obvious you love being outdoors and engaging in lots of adrenaline sports. How did you get your start in boating? AG: I built a house in a neighborhood with a large lake nearly ten years ago. While the house was under construction, I would daydream about waking up early and kayaking in the mist on the lake. I went so far as going to REI and talking to them about a boat, but was not impressed with their practical recommendations of a plastic sit on top kayak. I had a romantic vision of a beautiful wood sea kayak, but the idea stopped there. It wasn’t until last February (2014) while in the Florida Keys that I signed up for a kayak trip in the Gulf that I had my first kayaking experience. When I came back to Georgia, one thing quickly lead to another. 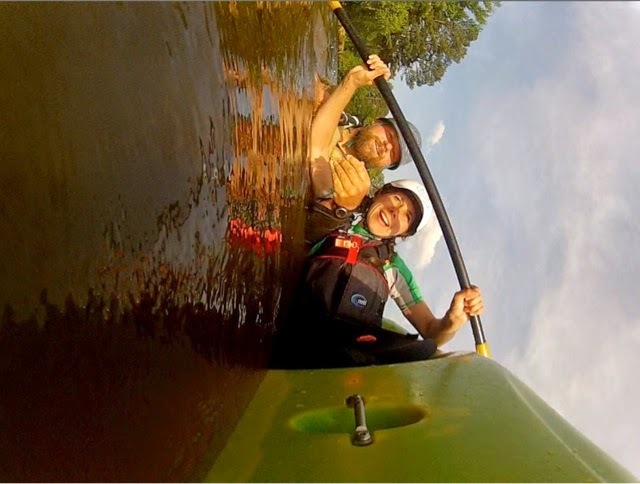 I searched for kayaking Meetups and found a few beginner flatwater paddling events. Then I learned about Tallulah and took pictures. From the pictures I met a few kayakers who took me down the Metro Hooch in a Jackson Karma and introduced me to the Georgia Canoe Association (GCA). 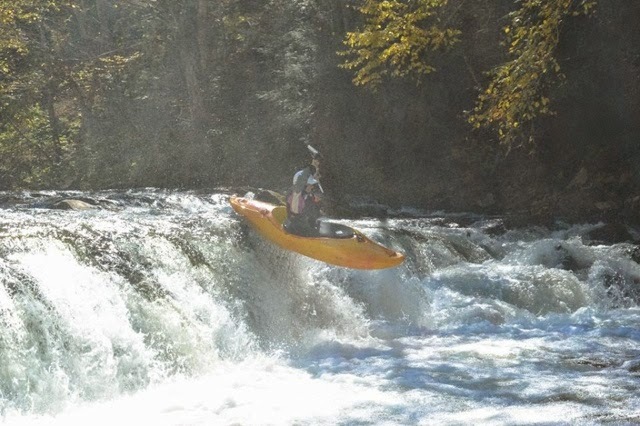 I took the GCA’s beginner white water course almost exactly one year ago and I’ve been kayaking as much is possible ever since. DBP: Your photography lives and breathes the passion that us boaters put into our sport. Paddling has the propensity to be a narcissist’s endeavor, and we all fancy ourselves photographers. Tell us a bit about how you get the perfect shot. What camera(s) do you use, and give us a couple do’s and don’ts. AG: For me the perfect shot requires precise focus, seeing expression in a boater’s face and a bit of scenery or exciting water spray. I used to use a Sony A99 before it drowned in a leaky Watershed bag. To save on weight and expense, I now shoot with a Sony A77 II. It is a crop sensor (smaller size than a full frame professional camera) but still shoots 12 frames per second and delivers good enough images for my personal projects. ~ High frames per second so you don’t miss a moment. Shooting at faster than 1/1000 of a second for white water. ~ An understanding of exposure and triangle of aperture, shutter speed and ISO and what each does to your picture. ~ Editing software that you know how to use. As for do’s and don’ts, do set your camera to shoot as fast as possible to avoid blurry images, do buy the best camera and lens you can afford and do edit your pictures using software like Lightroom. As for the don’ts, try to place your boater all over the image frame rather than in the center and don’t be afraid to get close and try different angles. DBP: I’ve been working a trip, taking photos for the raft company I guide for, and been caught putting the camera down and picking up the rope when things got heavy. Have you ever been shooting and witnessed a bad WALLACE? AG: Luckily no. I have seen and photographed swims but they have all been minor. I keep telling myself to carry a rope and whistle with me while I shoot from the bank. After discussing it with friends, we decided a rope may not be a great idea without a helmet and PFD to match in case I go in the water, but I still want to put a whistle on my camera strap as I tend to see swims sooner than boaters on the water do. DBP: You’ve captured action all over the Southeast. What’s your favorite location to shoot? Is there anywhere that you’ve been that you’d rather not return to? AG: I don’t know if I have a favorite location right now. Roadside is definitely easier from a logistics standpoint. You can plan your shots ahead of time and get a group of boaters to eddy out and wait for you to get ready. 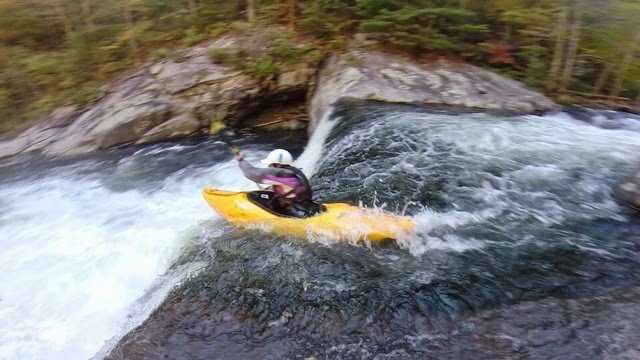 I’ve recently tried this on the Tellico and Cheoah with a lot of success. Otherwise you are stuck at one rapid waiting for boaters, too afraid to move in case you miss someone but then frustrated that you aren’t capturing much variety in your shots. Having said that, the goal of every photographer is to get a shot that no one else has seen before. And to do that, you’ve got to use equipment that they don’t have, or try angles that they haven’t thought of, or go to places they haven’t been. So getting into more remote areas of a river will be something that I do this year. DBP: This is always one of my favorite questions for a Dirtbag. What’s your favorite stretch of river and boat? What rapid puts the fear of WALLACE in you? AG: My boat experience is pretty limited. I started with a Jackson Karma small and then moved to a Dagger Mamba because it fit me better. I’ve tried an RPM once and will probably paddle it more as well as try play boating this year. 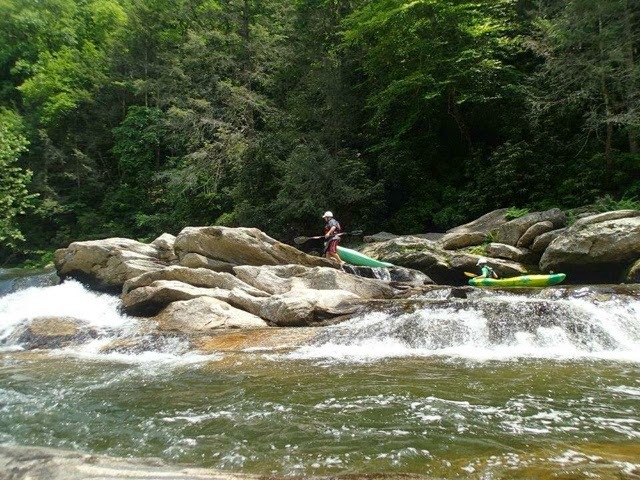 My favorite river to date is the Upper Nantahala. After photographing it and thinking it looked like fun, I wanted to try to run it on the last release. I wasn’t sure if I was ready for it or not but I had a great crew and decided to show up and see. They were great about introducing me slowly, putting in below Troll’s Hole, then below PB&J and then finally running it from the top on my last run. What I love about about the Upper Nanty is that it is fast moving and narrow, without actually being very technical. 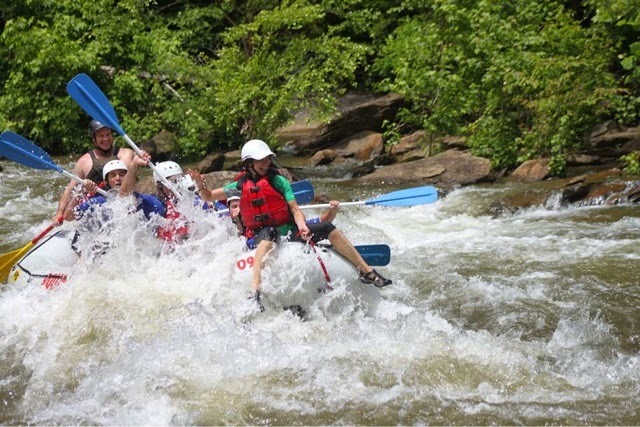 Other than 2-3 rapids, you can run any line and just get used to the speed of the river. For a newbie, I found it confidence inspiring, especially after knocking out several combat rolls and continuing to hammer down without missing a stroke. 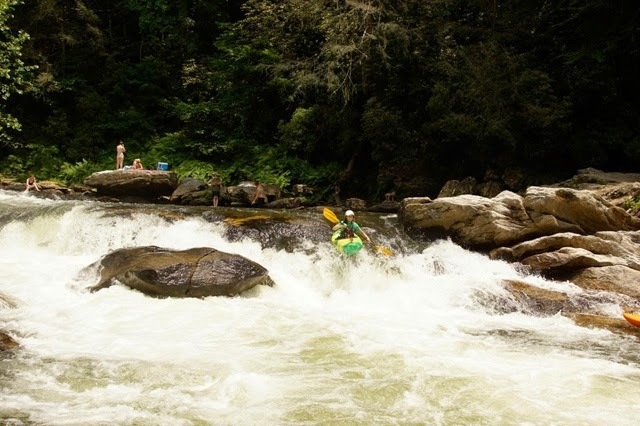 As for the fear of Wallace, I still don’t like Section 4 of the Chattooga. I have been on Section 4 four times. Each time I portaged Jawbone, Corkscrew, and Sockem Dog. That part of the river really winds me up. As soon as we pass Woodall, it is like I stopped breathing until I am sitting in my boat below Sockem dog. One of my goals this year is to run all of the Five Falls confidently. 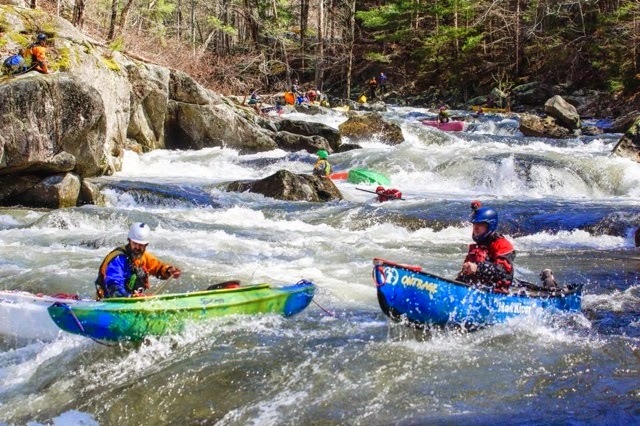 DBP: 25 years ago whitewater was a man’s world and women were viewed with skepticism on the river. 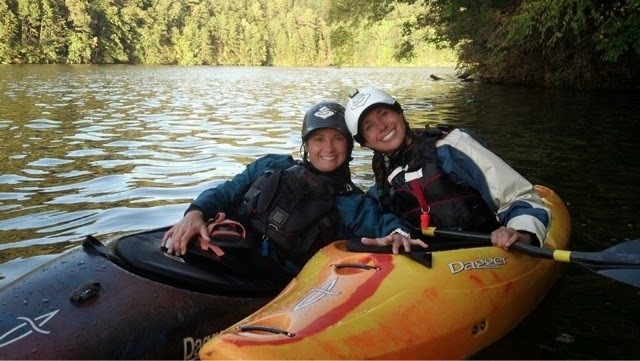 We at Dirt Bag Paddlers are very proud that we find that philosophy to be ridiculous, and we all paddle with tons of great ladies on all sorts of Class V, and work side by side with awesome female raft guides. We’re also stoked to host Women of Whitewater Wednesday, and we’re pleased to bestow that honor on you tonite. 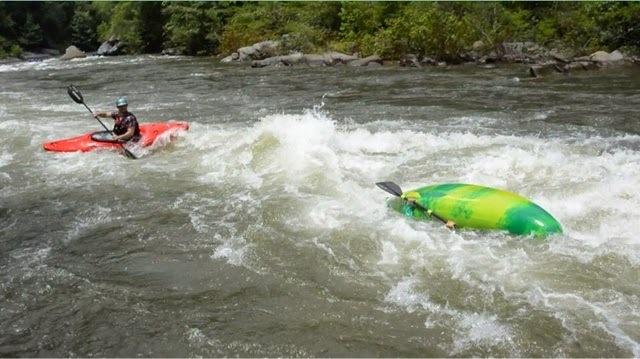 You’ve paddled with and captured some truly awesome top rank ladies on film, most recently at the OUT Race during Ain’t Louie Fest a few weeks back. 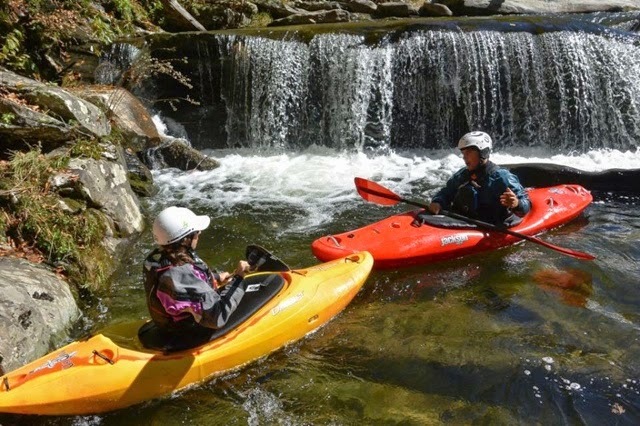 Anything you’d like to share to young girls entering into paddling? AG: To me, paddling is about discovering and realizing your own personal power. Everyone wants to be a bit of a badass, and facing mother nature together with the best and worse of yourself is definitely one way to go about it. To get better you have to come to terms with your ego, mental habits and your fears. I always say the river is a teacher. It mirrors how you are in life but much more clearly. If you take the time to watch how you respond to the river, your swims, your beat downs, yourself talk, trying something uncomfortable vs. what you know, you will also see how you respond to your everyday life in the same way. Learning to boat is a journey of self discovery mixed with excitement, tears and fun. You can’t boat and not have great stories to tell and close relationships with people. You just have to be willing to be uncomfortable. DBP: Boating season is upon us – finally! What’s in store for THE UNBORED LIFE this year? AG: This year, I will be climbing Rainier with my boyfriend, Burton. To train for the climb, I should be wrapping up a five day, 60+ mile hike for my first backpacking adventure. On my list this year is also canyoneering in vertical caving as well, all with the camera in tow! DBP: Right on, Angela! Cheers to you! We look forward to more collaboration, hopefully another story in our Mag, and of course following your adventures in THE UNBORED LIFE! Pictures of Angela by Burton Greer, Wade Harrison, Nathan Madlock, and Clint Miller.